The timing -- and the pain -- couldn’t have been worse. Bemidji was playing in the state hockey tournament for the first time in the program’s history, and star defenseman Gary Sargent was so sick he could hardly breathe. Sargent was a senior in 1972 when the upstart Lumberjacks knocked two longtime Section 8 powerhouses out of the playoffs. Bemidji beat Roseau 2-0 in the section quarterfinals and pounded Warroad 6-1 in the semifinals. Appearing in a section final for just the second time in school history, the Lumberjacks routed East Grand Forks 6-1. Bemidji’s leading scorer as an eighth grader, Sargent was moved from forward to defense before his sophomore season. Rarely leaving the ice, Sargent controlled long stretches of play with his end-to-end puck-rushing ability. When the opportunity arose, the 5-foot-10, 200-pound Sargent also had the strength and agility to knock opposing players off the puck – and their skates – with his punishing physical style. Johnson said Sargent never went out of his way to run players through the boards, even though he had the strength to do so. But if there was an opportunity for Sargent to make a monster hit, well, there was no hesitation. Harris, much to Johnson’s surprise, picked himself off the ice and finished his shift. A few minutes later, Harris and Sargent again collided in dramatic fashion. Gary Hokanson, a Roseau assistant coach at the time, remembers Sargent’s run-ins with Harris. An all-state football selection who played linebacker and fullback, Sargent was wooed by more than a dozen major college football programs. As a pitcher and infielder renowned for his prodigious home run blasts, Sargent turned down a contract offer from the Minnesota Twins. “I thought my chances were better to make it in hockey than any other sport,” Sargent said. When Bemidji arrived at the Met Sports Center in Bloomington in March of 1972, the expectation was for Sargent to showcase his vast array of skills to a statewide audience and platoon of college coaches and pro scouts. Even though Sargent scored two goals and assisted on another in the Lumberjacks’ 8-3 quarterfinal loss to eventual champion International Falls, it was obvious to Bemidji’s coaches and players that Sargent was hardly his usual, dominant self. Bemidji lost to Alexander Ramsey 4-1 in the consolation round. 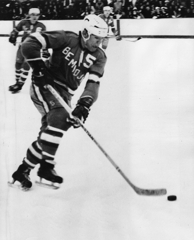 Related by marriage to Warroad’s Henry Boucha, another Native American superstar who went on to play in the NHL, Sargent scored 23 goals in 30 games at Bemidji State in his only season with the Beavers. 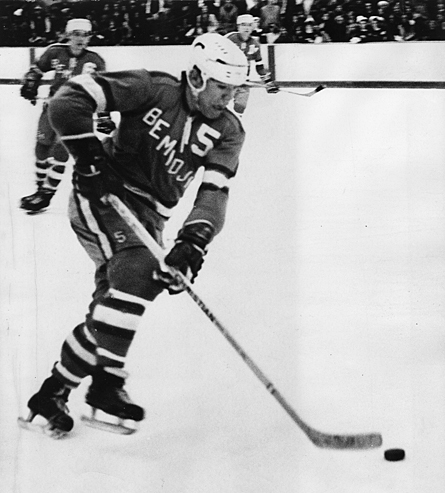 Intent on improving his draft status, Sargent played the 1973-74 season with the junior-level Fargo-Moorhead Sugar Kings. He scored 37 goals in 48 games and was drafted in the third round, 48th overall, by the Los Angeles Kings. Sargent was named the Kings’ Outstanding Rookie after the 1975-76 season and was honored as their Outstanding Defenseman in 1976-77. 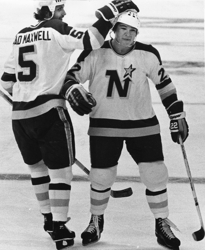 He signed as a free agent with the Minnesota North Stars in 1978 and was named to the 1980 NHL All-Star Game. He didn’t play in the game because of a back injury that would eventually cut his career short. Sargent, who retired from pro hockey in 1983, lives in the Bemidji area.